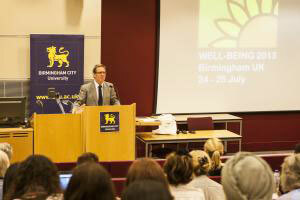 Over 100 delegates drawn from a wide range of professions came together on 24 July for ‘Well-being 2013’ hosted by Birmingham City University to discuss the multi-dimensions of well-being. Well-being 2013 followed the success of the first conference in 2011 and retained a similar focus which emphasised approaches to research and practice within this area that fall outside the traditional concepts of well-being as part of medical research. There were also opportunities to look at well-being within both current design and health agendas and to debate what ‘well-being’ means to individuals, how it can be supported and how to advance our overall understanding. The two-day conference attracted delegates from a diverse audience that included social care, environment, health, arts and humanities, researchers and academics. Participants attended from across the UK and mainland Europe and as far afield as Canada and New Zealand; all with the aim of exploring what ‘well-being’ actually means in today’s society. Delegates also had the opportunity to participate in eight interactive workshops ranging from exploring language and movement through to an interactive session by Amy Twigger–Holroyd’s knitting circle that considered the personal relationship between craft and well-being. Colette Jeffrey, sign designer, graphic design lecturer and PhD researcher at Birmingham City University, explored the impact of getting lost on an individuals’ well-being, while BIAD’s Dr. Mohsen Keiany, PhD, examined whether an art-based break can contribute to an increased level of satisfaction in individuals. A ‘moving forward’ review meeting is now scheduled to consolidate the discussions generated as a result of the Well-being 2013 conference and to consider future actions, such as integration with existing research, future collaborations, the local agenda, partnerships and plans for future publications.